Join Influx Press and Paul Scraton at Curious Fox Books, Berlin for the German launch of Paul's debut novel, BUILT ON SAND, following in the footsteps of the acclaimed GHOSTS ON THE SHORE. Paul will be reading from the novel and doing a short Q&A with editor Gary Budden, followed by a book signing. If you know where to look, urban landscapes provoke us to journey through the melting pots of ideas, cultures and histories built into its concrete. Writers Bahriye Kemal, Paul Scraton and Gary Budden share vivid portraits of their cities, from militarised borders, from remembering divided pasts and places more imagined than real. Join Influx Press and Paul Scraton at Book Corner Halifax, celebrating the publication of Paul's debut novel, BUILT ON SAND, following in the footsteps of the acclaimed GHOSTS ON THE SHORE. Paul will be reading from the novel and doing a short Q&A with editor Gary Budden, followed by a book signing. 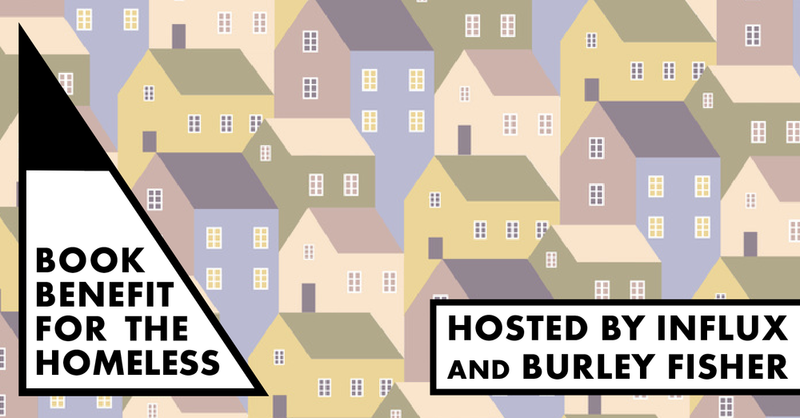 On March 27th, Burley Fisher and local publisher Influx Press are hosting a book benefit night for Hackney charity North London Action for the Homeless, alongside independent publishers such as Granta, Canongate, Atlantic, Jacaranda, Influx, Peninsula, OWNIT! and Open Pen, with more to be added later. The event will have local authors Tahmima Anam, Ashley Hickson-Lovence and Wayne Holloway plus a guest spot from Women’s Prize shortlisted novelist Meena Kandasamy reading from their work. Books donated from 10 selected publishers will be available for audience to buy for 50% off RRP, beers will be provided by local brewery Five Points, and wine from a local merchants – with all proceeds going to NLAH. North London Action for the Homeless has been operating for over 26 years in Hackney, providing free three course meals and support for the homeless, including hair cuts, health checks and clothing. Helena Smith from NLAH said they were “thrilled” to be involved and are looking forward to the event. Join us for the evening to buy books, talk to authors and publishers, raise money for and celebrate the work of North London Action for the Homeless. Hosted by editor and author Gary Budden with Influx Press, join us for an evening of films, readings and photography exploring the weird and the eerie to celebrate Adam Scovell’s new novel composed around vernacular images, Mothlight. The two are joined by photographer and visual artist Ellen Rogers, and writer and performer Soma Ghosh. Germany’s Baltic coastline is a place of breath-taking beauty, the former Cold War dividing line between East and West and the setting of some of the darkest moments in 20th Century German history. Lancashire born, Berlin-based travel writer Paul Scraton blends travelogue, history, family memory and fiction in an unsettling, moving mythology of this place and its people. Join Influx Press for the London launch of Gareth E. Rees' second novel, THE STONE TIDE: ADVENTURES AT THE END OF THE WORLD, celebrating a new work of weird coastal madness. Buy books, get them signed, and drink wine – as ever, in one of our favourite independent bookshops, Burley Fisher in Haggerston. Gary Budden, Paul Scraton, Eymelt Sehmer and Gareth E. Rees head to Hastings to share their recent work about coastlines, looking at the psychology of life beside the water and its impact on our memories, emotions and sense of history. Join editors Kit Caless and Gary Budden along with author Eley Williams in a special discussion about London writing. How do we find new ways of writing about the capital? How do we step away from the shadow of all those great books that have come before us? "With great humour and insight, author Jeffrey Boakye dissects Grime tracks to see what the genre tells us about Millennials, Black Masculinity and being a Londoner." An event to celebrate the recent launches of books by Elizabeth-Jane Burnett (Penned in the Margins), Tom Jeffreys (Influx Press), and Camilla Nelson (Knives Forks and Spoons Press). Paul Scraton in conversation with Dr Anna Saunders, Bangor University School of Modern Languages. Paul will be discussing two of his books: Mauerweg. Stories from the Berlin Wall Trail (co-authored with Paul Sullivan) and Ghosts on the Shore: Travel's Along Germany's Baltic Coast. We're running an Influx Press stall alongside Punk Ethics at this year's London anarchist bookfair – come down and say hi! In conversation with Jeffrey Boakye, author of Hold Tight a new book about being Black, British and born after 1980, we discuss the evolution of Black British music. Join the hot debate about where grime sits in music's histography and dispel the myths and disconnection between generations. This event will explore Tom Jeffrey's Signal Failures, published by Influx Press, which provides, through a walk along the proposed route of HS2, a wide-ranging critique of humanity’s most urgent failures. This event will celebrate Chris McCabe's ongoing publication project with Penned in the Margins, following In The Catacombs and Cenotaph South, with new work responding to Kensal Green Cemetery. This event will see the launch of Worm Wood / in / Old Oak, a new pamphlet of poems by SJ Fowler, published by Sampson Low, written about the Cemetery and its impending neighbour, the Old Oak development. An evening of readings and discussion with three of the UK's most interesting presses, poets and writers. Join us for the London radical bookfair! Radical booksellers, publishers, artists and activists of all stripes are setting up in the Great Hall at Goldsmiths University to host the the 2017 London Radical Bookfair. Join us at FC Magnet for the Berlin launch of 'Ghosts on the Shore: Travels along Germany's Baltic Coast' by Paul Scraton, published by Influx Press. Paul will be joined by editor Gary Budden for a conversation about place, the stories of the Baltic and the themes raised in the book. There will be some readings, and Gary will host a Q & A. We will also be screening a short film by Eymelt Sehmer, inspired by the book. Eley Williams is reading as part of Alex Clark's 'Rising Stars' event at Stoke Newington Festival. It's free to attend! Jeffrey Boakye will be speaking about Hold Tight, grime and black music with Reckless Rai and Derek Wiltshire of Mostly Lit podcast and grime artists Krucial Kidd. Kit will be talking with beer writer Pete Brown about the 'Wetherspoon's Paradox' and pub interiors in what should be a high amusing event.